> This view shows the North porch (1) which faces the Albert memorial in Kensington Gardens. The Albert Hall is slightly oval-shaped, not circular and this viewpoint shows it at its narrowest. 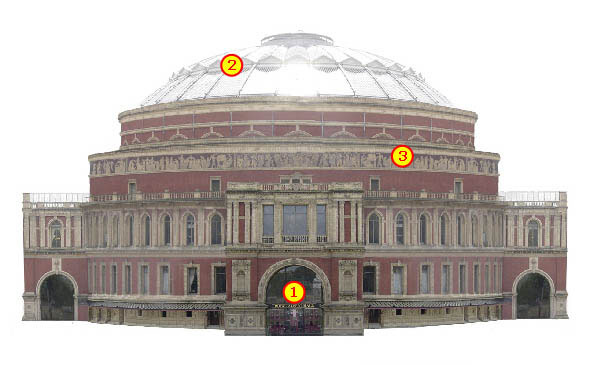 > The iron and glass domed roof (2) of the Albert Hall has always caused serious problems with the acoustics, and has been corrected by hanging various types of reflectors and diffusers from the ceiling. The present fibreglass 'saucers' are the most successful to date. > Before 1888 and the installation of electric lighting, illumination of the hall was by limelight. Cylinders of lime were raised to 'white' heat in a gas flame. > The Royal Albert Hall is famous for hosting the annual BBC Promenade concerts (the 'proms').